The Advertising Standards Authority (ASA) has banned The Macallan’s first global advertising campaign for promoting “risky or daring behaviour”. The Macallan’s Make the Call campaign was released in November last year, “marking a new chapter” for the Edrington-owned Scotch whisky brand – hot on the heels of the opening of its new £140 million (US$180m) distillery. Make the Call centred around the theme of “bold decision making” and featured a 90-second “hero film”. However, the ASA received six complaints about the advert – which was broadcast on various platforms including TV and Instagram – questioning whether the advert was irresponsible and connected alcohol with “daring, toughness or irresponsible behaviour”. The Make the Call video features a man jumping off a cliff and falling towards the ground. As he falls, feathers begin to emerge from his arms and he grows wings. While the ASA noted that some parts of the ad were “fantastical”, including how far the man fell through the clouds and his sprouting of wings, it ruled that the tagline question was one that promoted risky or daring behaviour. It considered the man jumping off the cliff to be akin to the extreme sport of base-jumping. 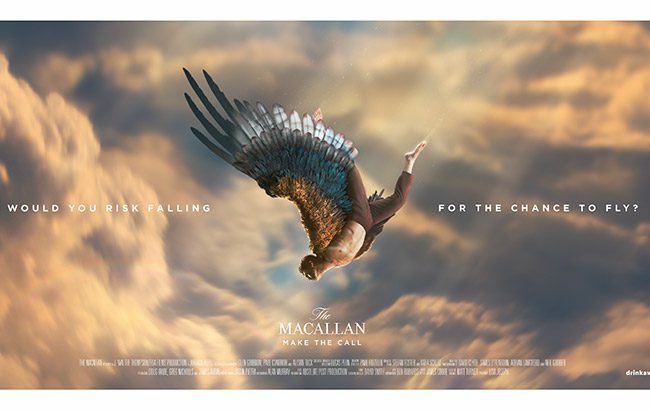 In defence of the complaints, Edrington said the term ‘make the call’ was used globally to describe the brand’s philosophy, and was a nod to decisions The Macallan had made in its past. Edrington added that the line was also relevant to decisions viewers make in their own lives. The company said the story was “mystical, almost mythical” and “clearly removed from the real world”. It refuted the claims the ad was irresponsible, or linked alcohol with bravery, daring or toughness. Furthermore, it highlighted that the ad did not show any alcohol consumption. In addition, ad clearance agency Clearcast said it had considered the issue of daring and toughness when clearing the ad, and decided the concept was fantastical enough to be acceptable. The ad was also shown on ITV Hub, a catch-up service for ITV channels in the UK. ITV said the ad was “imaginary, fanciful and dreamlike”. Meanwhile Instagram said the ad did not violate its policies and it had not received any complaints about the video. A spokesperson for The Macallan said: “The Macallan co-operated fully with the Advertising Standards Authority in response to a small number of complaints about our brand’s global awareness campaign. Prior to launching the campaign, we worked closely with the relevant bodies including Clearcast, ITV and Instagram who all deemed the campaign 100% acceptable. “In light of the ASA ruling, we have acted to address their concerns and removed the campaign film from relevant channels accessible by the UK audience. As phase one of the campaign is now complete, we will take onboard the ruling as we plan for [the] next phase of the campaign.